You'll find a student's transcript and course mapping tool on his Profile > Student view. The transcript is your school's official record of the student's completed and in-progress coursework. It is organized around the student's academic programs. Course Mapping shows you how the student's courses are applied to his academic programs. If you're using Populi to track clinical hours, this tutorial explains how they appear on the transcript. Use the program drop-down to see the transcript for individual programs, or to see courses that aren't mapped to any programs (None). If you wish to apply unmapped courses to one of the student's programs, use the course mapping tool. Each program's transcript leads off with a summary of the student's degree(s) in that program. Then it summarizes the cumulative resident, transfer, and overall credits/hours, grade points, and GPA. If a disciplinary action was recorded for the student in this program, you'll see a note to that effect. Resident courses are shown in order of academic term; each term includes any discipline and honors together with term and cumulative GPA. Click to see a pop-up with the student's course comments. Finally, it summarizes accepted transfer courses. You can export the student's transcript (official or unofficial), send a PDF version, view the student's transcript export history, or request an official transcript on behalf of the student. 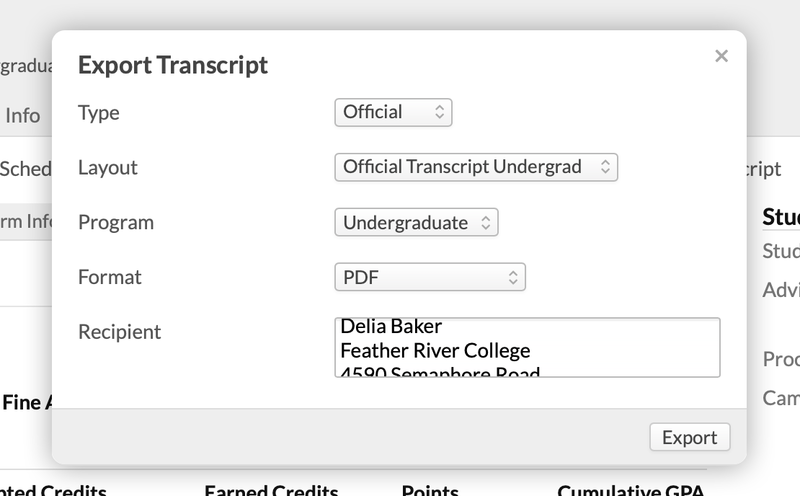 Select if you want to export an Unofficial transcript or an Official copy. For unofficial transcripts, check if you wish to include an appendix with course descriptions. If an official transcript, choose a format. You can export it as a PDF or an Open Office (.ODT) file. Pick a layout. Your options are any custom transcript layouts, the built-in transcript template, and the EDI TS130 electronic transcript format. Enter the recipient (if any) of the transcript. This option is only available if you've enabled web transcripts. You can change or add recipients, edit the message, choose whether to encrypt the transcript, and choose how to send the transcript password. If you've enabled web transcripts, make sure not to mess with the URL in the email! Click Send and Complete to fulfill the request. 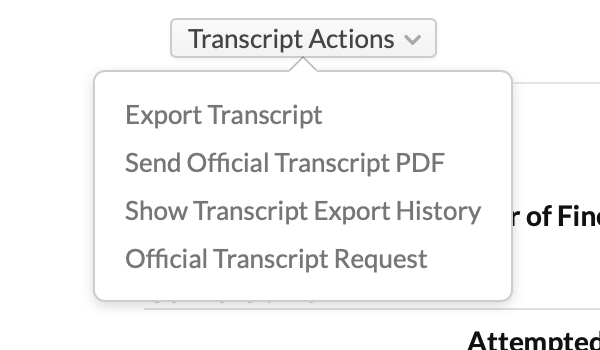 The transcript export history shows every time an official transcript has been exported or requested for this student. For web transcripts, you can click to download the PDF, see who has downloaded it, or delete it (which deletes the URL others use to download the PDF). For transcript requests, click the date to see the transcript request's info page. Course Mapping shows you how the student's courses are being applied to his academic program(s). You can use the tool to, for example, apply an undergrad course to a student's graduate program, or remove a remedial "test-out" course from a student's transcript. You can also use the tool to manage the student's retakes. Select one of the student's programs from the drop-down to see which of his courses are being applied to it. Courses can be associated with more than one program (one of which is the primary program). Course mapping will always default to map a course to its primary program. A course can be mapped to only one program at a time—or none at all. If a course is unchecked for all programs, it will no longer appear on the transcript or degree audit. 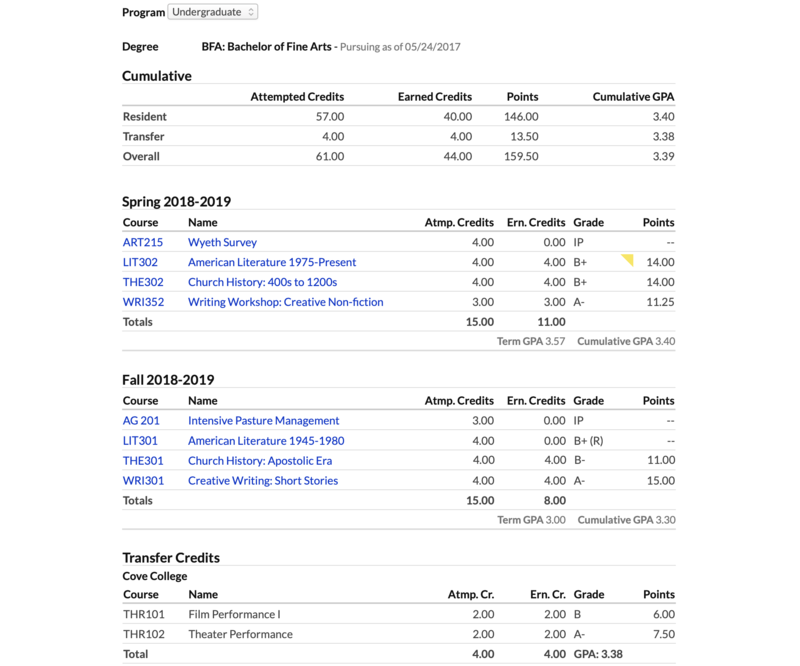 To see any of the student's courses that are not applied to any program, go to the transcript and click the notice that says There are _ courses that are not mapped to a program..
A checkbox next to each course indicates whether it's applied to that program. You can check/uncheck courses individually or click check all/none. If a course is applied to the program, you'll be able to change its Retake status. When you're done making changes, click Save to commit those changes to the student's record (you can also undo changes.